Read this topic to learn how to use each of the design elements that are available for use with the various content designers. Some elements are available for all designers and some are specific to email, marketing pages, or forms. This section provides full details for the design elements that are provided in all (or nearly all) of the contexts where the designer appears (email, marketing pages, and marketing forms). Text elements create a block of text within a column. You can edit the text of any new or existing text element by working directly in the element on the canvas. Use the inline toolbar at the top of the selected text element to do inline styling like font face, font color, bold, italic, paragraph justification, and more. You can also delete, clone, or move a selected text element by using the toolbar. Select a text element and use the settings provided on the Properties tabs to stylize the element itself by using colors, fonts, margins, borders, and backgrounds. Many of the settings on the Style tab (which apply to the overall page, form, or message design) also affect the styling of text-element content unless overruled locally. Image elements add an image to a column, outside a text element. Image elements interact with the Dynamics 365 image gallery, which helps you store, categorize, find, and share your image files. When you first add an image element, an image placeholder appears at the location where you dropped the element. Select the image placeholder and open the Properties tab, where you can set the following options. Enter a URL directly in the field. Select the Image Gallery button next to this field to select an existing image from the gallery, or to upload a new one. When an image is selected, its URL is shown here. Alt text: Enter a short description of the image. This text will be read aloud to contacts that are using a screen reader, and will also be shown to contacts that have images disabled in their browser or email client. Link: Enter a URL here if you'd like the image to function as a link. Alignment: Choose how the image should be aligned relative to its column (left, right, or center). When you select an image element, you can use an inline toolbar to delete, clone, or move the element. Video elements position videos from your video library in your design. Each video record in your library stores a name, video URL, embed code, and thumbnail URL. The library doesn't contain the videos themselves, just these references to them, so you must host your videos somewhere else, such as on one of the major video platforms like YouTube or Vimeo. When you first add a video element, an placeholder icon is shown at the location where you dropped it. To choose the video to show at that location, select the new video element, open the Properties panel, and use the Source lookup field to find and select the block that contains the content you want to include here. If you are creating an email, then the video element places a thumbnail image with a link to the video; if you are creating a marketing page, then it places an embed code instead. For more information about how to set up your video library and use videos in your content, see Create a video library and add videos to your designs. Content blocks let you establish a block of common content that you can reuse in multiple emails, forms, and/or pages. Use them to establish common headers, footers and other blocks of content that you would like to standardize across your communications. Content blocks work like templates. They include a fixed collection of content that you add all at once to a design. Once added, the content is copied into your design and doesn't maintain any connection to the original block content, which means that if you edit a content block itself, or its content in a particular design, other designs that already use that block won't be affected. Use the content-block element to add a content block to your design. When you first add the element, a placeholder icon appears at the location where you dropped the element. 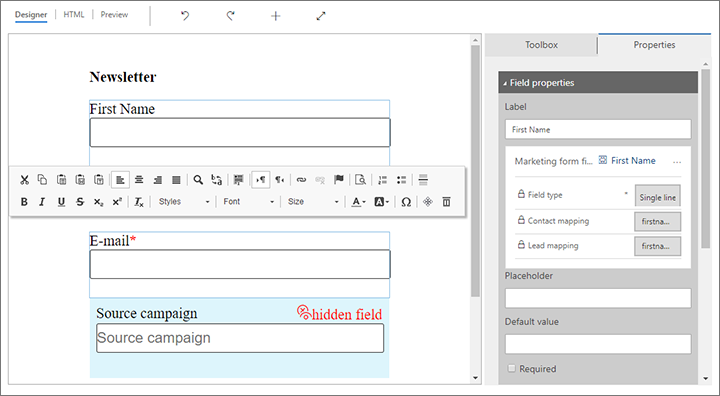 Select the new content-block element, open the Properties panel, and use the Content block lookup field to find and select the block that contains the content you want to include here. Divider elements insert a horizontal line (<hr>) in a column, outside a text element. Use the Properties and Style tabs to establish the appearance of your new or selected divider. When you select a divider element, you can use an inline toolbar to delete, clone, or move the element. Button elements create a colorful call-to-action button in a column, outside a text element. Each button is created by using pure HTML text and styling only (no image files), and acts as a link to the URL you define for it. Use the Properties tab to establish the appearance of your new or selected button. When you select a button element, you can use an inline toolbar to style the button text and to delete, clone, or move the element. This section describes design elements that are only available when you are designing a marketing email message. Use the Properties tab to view, enter, and edit the code to be placed by a custom-code element. Each time a contact registers for an event, the system creates a new event-registration record, which identifies the contact, the event, and other details. It event-registration record also includes a registration ID stored both as an alphanumeric code and as a machine-readable QR code. Use QR code elements to place an event-registration QR code in an email message. The code placed in each message provides the registration ID associated with both the recipient of the message and a specific event. Use the Properties tab to identify the event for which the QR code applies. No other settings are required. The QR code is a direct encoding of the registration ID itself. On the day of the event, event workers can quickly and easily scan the code using a QR code scanner or smartphone app. The scanning app could then query the registration database in Dynamics 365 for Marketing to confirm validity and/or to register attendance. Please note, however, that custom development is needed to create the scanning app and implement the integration with your Dynamics 365 for Marketing system. Each of these types of elements creates a colorful button in a new row (outside a text element) that links to a page, event, or survey (depending on the element type). The button is created using pure HTML text and styling only (no image files), and acts as a link to the page, event, or survey you define for it. Use the Properties tab to establish the appearance of your new or selected button, and to choose the page, event, or survey it links to. Surveys are optional. If your system admin decided not to include Voice of the Customer as part of your Dynamics 365 for Marketing installation, then the survey element will be shown as unavailable (greyed out) in your Toolbox. Contact your system admin if you want to enable it. This section describes the form element, which is only available when you are designing a marketing page. This is currently the only element that is unique for marketing pages. A form enables visitors to register for something, manage their mailing-list subscriptions, forward a marketing message, or otherwise submit information to interact with your marketing initiatives. Marketing form: Choose the marketing form to be placed by the form element. Usually, you'll just use an existing form, but you can also create a new one from here if needed. You can only select or create a marketing form that matches the current page type. Update contacts/leads: This is a read-only field that shows whether the selected marketing form is set to update contacts and/or leads in response to form submissions. Confirmation message: Enter a message to show to visitors right after they submit the form. Use this to thank the submitter and confirm their submission. Error message: Enter a short message that tells the user that a temporary error has prevented the system from accepting the form submission. For example, "We can't accept your form submission right now. Please try again later." Limit exceeded message: Enter a short message announcing that the system has stopped processing new submissions temporarily, and inviting the user to try again later. This situation can occur if the server detects a submission pattern consistent with abuse of the system and has therefore entered a defensive stance. Redirect URL: Enter a URL to send the submitter to immediately after they submit the form. This typically would be a page on your own website that thanks the submitter and confirms their submission, or some other message related to the purpose of your marketing page. The designer provides many elements that are unique to marketing forms. They are all related to positioning and configuring various types of input fields and form controls. Label: Enter text that describes the value expected by the field (such as "first name"). This text will be displayed close to the field in the form. Field information: Below the Label is a box with information about the field mapping. Most of this is read-only and comes from the field setup. You can choose a different field mapping here if you want, but usually you select that when dragging a field element to your form. Placeholder: Enter "ghost text" to be displayed in the field until a value is entered. This text is typically shown in a gray color. You can use this as an alternative to, or in addition to, the field label. This isn't a default value because if the user doesn't enter a value, the field is submitted as blank. Default value: Enter a default value for the field. Unlike the Placeholder, if a user submits the form without editing the default value, then the default value is saved with the submission. Required: Select this check box to set the field as mandatory. Mandatory fields display an asterisk in the form. All fields marked as required must be filled in when the user submits the form, otherwise the submission will be rejected and the Required error message will be shown. Required error message: Enter a message to show to users if they try to submit the form without including a value for this field (only available when Required is selected). Label Position: Choose the position of the field label relative to the field (top, left, or right). Forms are nearly always intended to create or update one or more database records—especially contact or lead records. However, record creation will fail if any fields required by the database are missing when the form is submitted. When you're designing a form, always be sure to identify all of the fields required by your database, and add a form element with its Required check box selected for each of them. That will ensure that contacts who submit the form will get an error message if any required values are missing. If you don't do this, then form submissions may simply be ignored without informing contacts of the problem. Your database could be customized to require fields that you don't expect, so be sure to talk to your system customizer or administrator if you're not sure which fields are required. The Check for errors function for forms doesn't identify all of the fields required by your database, especially custom fields, so you can't depend on it to inform you of this issue. Always be sure to test your form to confirm that it creates the types of records you expect it to. Landing pages: When the form is submitted, the contact is added to all lists that are checked, but is not removed from lists that are unchecked. You can choose the default value (checked or unchecked) for each list as needed. Subscription lists on landing pages aren't prefilled to indicate the visitor's current subscriptions. Subscription centers: When the form is opened, each check box is always prefilled to indicate the current visitor's subscriptions. When the form is submitted, the contact is added to all lists that are checked, and removed from lists that are unchecked. Subscription List: Shows the name of the subscription list the element represents (read-only). You can click here to open the list itself. Default Value: This is only available if you are working with a landing-page form. Use it to set the default state of the check box (checked or unchecked). Label Position: Position of the label (list name) relative to the check box. Label: The name of the subscription list, as shown on the form. Forward-to-a-friend elements create a collection of input fields that recipients of your marketing email messages can use to forward a copy of that message to each email address that they specify. All forward-to-a-friend forms must include exactly one forward-to-a-friend element. This element is not available for other types of forms. Ask for friend's name: Controls whether to include a field for entering names in addition to email addresses. The form always requests email addresses. Number of recipients: Sets the number of name/email input pair fields created by the element. Do-not-bulk-email elements add a check box to a subscription center form that enables visitors to opt out of all marketing email messages. This feature is required by law in many jurisdictions, and helps maintain your organization's email reputation throughout the internet, thus helping to keep your marketing messages from getting filtered away or stuck in spam traps. All subscription center forms must include exactly one do-not-bulk-email element. You can also include this element in landing-page forms, but it's not required. The do-not-bulk-email element is a standard form-field element that is permanently configured to map to the "Do not bulk email" field of the contact entity. Other than this, all its properties are the same as those for standard field elements, as described in Field elements. The remember-me element is a standard form-field element that is permanently configured to map to the "Allow form prefill" field of the contact entity. Other than this, all its properties are the same as those for standard form fields, as described in Field elements. Submit-button elements create a submit button for the form. All forms must include exactly one of these. Its only property is the button text, which establishes the text shown on the button. Dynamics 365 automatically adds a submit-button element to each new form you create. This type of element is not otherwise available in the Toolbox, so you should take care not to delete it from your forms because there is no way to add it again (other than immediate undo). Reset-button elements create a reset button for the form, which when selected removes all values for all fields in that form. All forms must include exactly one of these. Its only property is the button text, which establishes the text shown on the button. Reset-button elements are only available when you are working with a forward-to-a-friend or landing-page form. Captcha elements add a captcha to your form, which helps make sure that only humans can submit the form, thus preventing bots from filling your database full of spam or noise. You've probably seen captchas before. They require you to recognize and repeat a set of characters designed to be difficult for a computer to recognize. The only property for captcha elements is the Language, which sets the language used in the instructions displayed for the captcha. Captcha elements are only available when you are working with a landing-page form. Forwarding pages and subscription centers don't need a captcha because they are only available to registered contacts.